Doors are shipped in wood crates and protected, but it is not uncommon for doors to suffer some minor scratches in shipping, uncrating, and installing. Note: These doors are hand-hammered wrought iron and a certain amount of marring or imperfection is to be expected. They are one-of-a-kind works of art and some of the marks add character and authenticity to the door. Shake Touch-up Paint supplied with the door. Dab scratch with touch-up paint and let dry. Contact Doors by Design for touch up paint. If there are dents, chips, or dings in the door, you may need to patch the area with automotive bondo. This type of repair should be performed by an individual who has experience working with bondo. Other Supplies Needed: Gin cloth, medium enamel paint reducer, metal primer, semi-flat black “Krylon” industrial aerosol spray paint, heavy duty latex gloves, “000” steel wool and “bondo”. Medium reducer can be purchased where automotive paint is available. Prep area for repair and clean well. Applying TOUCH UP paint (provided by Doors by Design). Mix with the medium paint reducer. Note: This is not a science, so you mix to match – approximately 1 part paint with 9 parts reducer. Make sure to stir regularly. While wearing heavy-duty rubber gloves, dip the gin cotton into the paint and reducer mixture, wring out thoroughly, and pat dry with a dry cloth. Dab gin cotton swab onto a part of the door that will not be conspicuous to test the color. Note: Outside of jamb is typically a good place to test color. Let dry and then add paint or reducer for closest match and try again (the paint dries quickly so it shouldn’t take long). Once the paint has been mixed to match the door the bondo area is ready for color paint. Dab the area with a very light coat (if you dab too much it will lift the black). Let dry and repeat as necessary. Once paint is dry go over area with (000) steel wool to clean and lift any cotton from painted surface. Wipe area with dry cloth and then spray with clear satin polyurethane spray from MinWax to blend the satin finish. 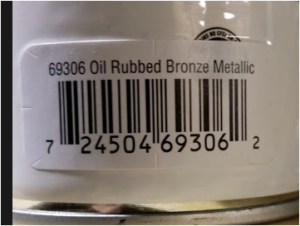 CLEAN YOUR DOOR WELL and REFINISH IT WITH THIS PAINT. For bronze or cinnamon color you will need to use a gin cotton rag and go over the door with the copper solution described above. Once you have the color as you like you can then spray using minwax satin polyurethane to blend in the finish.